From world-class fishing to boating or a float down the Slate River, the fresh water we protect offers incredible recreational opportunities. Water protection is also crucial to ensure our clean supply of drinking water and habitat for the many species of animals that share our backyard. Fishing access is permitted at the preserved confluence of Coal Creek and the Slate River. However, the area is home to sensitive wetlands, and all fishing much be not impact wetland habitat. Organized, commercial, or groups greater than two people are discouraged; use during sensitive seasons (April through June) is restricted; and use when livestock are on site is restricted. Fishing must be catch and release, with barbless hooks and no bait, and with valid Colorado fishing license. Despite our mining reclamation of the Peanut Mine, there is still toxic mining waste at the bottom of Peanut Lake. Floating or SUPing on the lake disturbs that waste, and risks contaminating the water for the many species that rely on it. Ensure that your PFD fits snugly around your body, and fasten all straps and buckles. There is public access on the water, but NOT on the surrounding land. Much of the land is owned by private individuals, and you will be trespassing on their land. Please respect this. The Slate River can be very cold, and very swift at times. Make sure you are comfortable with conditions, and float/SUP at your own risk. You can check the Slate River gauge here. Also note that the Slate River is snow-melt driven. By mid-late summer, the water level becomes too low to float and trespassing is inevitable. It is your responsibility to avoid trespassing by checking conditions before heading out. We have been working closely with the community for over 25 years to preserve the incredible Slate River wetlands. Pack out everything that you bring with you, including any paddles. The Slate River wetlands offer important habitat for so many plants and animals, among them great blue heron and elk. Both of these animals raise their young in among the willows, and it is crucial that we do not disturb them. All dogs must be on a leash to prevent wildlife harassment. Pool toys are discouraged. The Upper Slate can be swift and rocky. Be sure you have a sturdy boat or board before you begin your trip. A rafter-friendly PVC pipe fence. Please float under the fence! Land surrounding the Upper Slate River is still used for grazing cattle, as it has been for generations. The Land Trust has worked collaboratively with ranchers and land owners to put up fencing across the river in order to keep cattle on grazing lands. The fencing is rafter-friendly, and designed to be floated under. On the Slate River, the rafter-friendly fencing is made of white PVC pipes and can be raised or lowered to accommodate river flows. Please never cut or remove fencing, and never get out of the river to walk around it. There is public access on the water, but NOT on the surrounding land. Much of the land is owned by private individuals, and you will be trespassing on their land. The Slate River can be very cold, and very swift at times. Make sure you are comfortable with conditions, and float/SUP at your own risk. 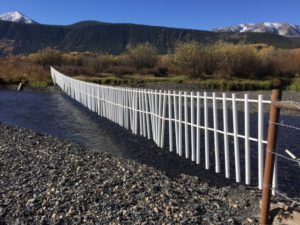 On the Slate River, the rafter-friendly fencing is made of white PVC pipes , and is designed to be floated under. Please never cut or remove fencing, and never get out of the river to walk around it.